While well-managed pasture is an asset to a dairy farm, poorly managed pasture can create serious problems. These can include the following. Poor plant growth due to overgrazing damage. Animal health problems, particularly parasite problems. This article will address some common pasture pitfalls and how they can be assessed. Overgrazing of pasture plants is likely the most common pasture pitfall on grazing farms. If a plant is grazed while it is still growing from carbohydrate reserves rather than from active photosynthesis, it has been overgrazed. Learning all the ways in which plants can be damaged by overgrazing is essential to managing pastures well. Overgrazing most often results from a few common mistakes including the following. Taking down all the interior fences in the fall and letting cows "clean up" the pastures. Having a "rotational" system of six or seven paddocks, with each grazed for one or two days. Leaving animals in a pasture for more than three days in a row. Returning animals to the pasture before all of the plants have regrown. Not adding additional acres into the grazing rotation when plant growth rates slow. "Untoward acceleration" is a term used by Andre Voisin in his book, Grass Productivity, to describe what happens when paddocks are not rested long enough between grazings. Each grazing of the paddock provides less forage and the regrowth period gets shorter throughout the grazing season until most of the plants are overgrazed and there is little or no feed left. Allowing livestock access to the pastures during the non-growing season can also cause damage, particularly during wet or freeze/thaw conditions. Soil compaction and damage to plant root reserves will sometimes be obvious, while in other situations, will result in slower spring growth rates and overall decreased pasture productivity. In using management intensive grazing (MIG), most dairy farmers give animals a fresh pasture after each milking. It is possible, however, to use larger paddocks and move cows less frequently. Livestock return to the pasture when it has fully recovered by regrowing to a minimum of eight inches. In the Northeast, this may be as soon as 14 days in early summer when plants are growing rapidly, but it may be 40 days or longer later in the summer. Animals should be moved frequently, so that cows do not graze each paddock for more than three consecutive days. Using smaller paddocks and moving the herd more often will provide more consistent high quality feed and higher overall pasture productivity. An important part of MIG is that when pasture growth slows, the speed of the rotation must also slow down. This is usually done by adding more acreage to the rotation. If the number of grazing acres is not increased, plants will not get enough rest, and animal dry matter intake will drop resulting in poor animal and pasture performance. Timing the first cut of hay early enough to allow some areas to grow back tall enough for grazing is the easiest way to provide good quality pasture when plant growth slows in the summer. The best way to make sure cows are eating enough DMI from pasture is to pay close attention to the size of the bite of pasture they receive. Pasture height and density determines this bite size. If the pasture is too short, then they cannot get enough pasture in each bite to meet their DMI needs, even if given a larger area to graze. Cows only take a certain number of bites each day and only graze for part of each day because they must also spend time resting and ruminating. This is one reason to provide a new pasture, which is tall and dense, after each milking. When cows go into a pasture that is tall enough, they can rapidly fill their rumens with high quality high protein feed. Managing for a dense pasture sward of the correct height results in better animal performance and a more profitable farm. When cows graze, they wrap their tongues around pasture plants and snip them off with their lower teeth and upper dental pad--they do not have upper teeth (See Figure 1). They generally first eat tender young plants and the tops of plants (leaves instead of stems). If they are grazing the same pasture for several days or a week, the nutritional quality of what they eat each day will change due to this selective grazing behavior. Using a higher stocking density (smaller paddocks) and moving cows to new pastures more often will result in more predictable pasture nutrient intake, which can make ration balancing and milk production easier to manage. Cows will reject some pasture around manure. This natural instinct helps them avoid areas containing parasites. The best way to manage these rejected areas is to improve the biological activity of the soil and population of insects, which rapidly incorporate manure into the soil. Clipping pastures immediately after grazing may help manage rejected forage for some farms, particularly in the first few years of grazing. Figure 1. 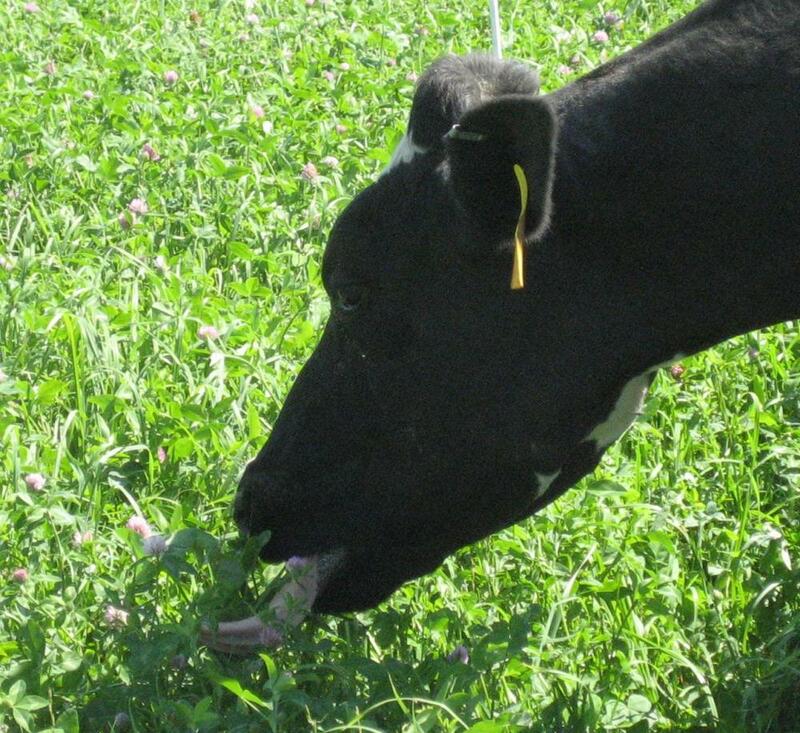 A Holstein reaches for a bite of good quality pasture with her tongue. Photo credit: Sarah Flack, Sarah Flack Consulting. What Pre-grazing Height is Best? The traditional MIG guidelines outline a pre-grazing height of eight inches for dairy cows. Turning cows into pastures which are too short will result in lower dry matter intake and some overgrazing damage to plants. There may be times when it is advantageous to allow pastures to grow even taller than eight inches before grazing, but once plants become too mature, the nutritional quality, palatability, and the ability of cows to get enough dry matter will be reduced. A few graziers are experimenting with much taller pre-grazing heights and very high stocking densities. This practice is particularly common on farms whose goal is to improve pasture productivity and soil organic matter. Graziers managing these taller pre-grazing heights must maintain a high stocking density so that grazing and hoof impact benefits are maximized. The challenge with "grazing tall" is that the digestibility of most pasture plants at these heights is lower and it can be difficult to maintain a high level of milk production when grazing more mature and fibrous pasture plants. Most dairy farms will find that choosing a pasture height that allows the plants to recover fully—yet not giving them time to become fibrous or too tall—will yield the highest quality dairy pasture feed. Many farmers begin grazing in the spring when the pastures are under eight inches tall so that they can begin to shift the dairy ration over to pasture gradually. This also makes it easier to keep up with the grass as it begins to grow rapidly in the spring. Grazing at under the recommended eight-inch pre-grazing height for this first grazing in the spring is acceptable so long as the pastures are fully recovered before returning the cows to the paddock. Refer to "Managing Dairy Nutrition for the Organic Herd: Managing Seasonal Diet Shifts" for additional guidelines for spring grazing to help the herd adjust to the new pasture ration. While the traditional spring grazing recommendation in most MIG systems has been to begin grazing early to prevent pastures from growing too tall, some graziers now delay their spring turnout date. The advantages of a later spring turnout include less grazing during mud season and improved plant vigor due to additional time for root growth. The disadvantage of a later turnout date is that more of the pastures can grow too tall and become overmature. A later grazing start date requires good management and preparation that includes mechanically harvesting or clipping some fields early to allow them to regrow and be added into the grazing rotation. A later spring turnout may also require a high stocking-density grazing system that can handle the higher pre-grazing heights. The two most common nutritional pitfalls during the grazing season are feeding too high a protein concentrate, and inadequate dry matter intake (DMI) due to pasture plants being too short. As soon as cows are grazing daily on cool season perennial pastures in the spring, grain and other supplemental feed in the barn must be changed to a lower protein mix. Adjusting the total mixed ration (TMR) to remove high protein feeds such as haylage can also help improve the grazing behavior and performance of the cows. If the protein content of the supplemental feed is not reduced, cows will lose condition and drop in milk production. If this imbalance continues, it may result in lower fertility and other health problems. Testing pasture forage quality and milk urea nitrogen (MUN) can help understand how to adjust the ration. Refer to the "Managing Dairy Nutrition for the Organic Herd: Assessing the Feeding Program" for more information on MUN, BCS (body condition scoring), and observing manure to determine if the ration is well balanced. Under a continuous or rotational system, there may be enough high quality pasture during the early part of the grazing season but as the season continues, the quality and quantity available to the cows will decline. This can result in much lower total DMI, and if not supplemented with additional forages in the barn, cows that will perform poorly. Understanding grazing behavior can be a helpful tool in maximizing DMI and animal performance. Cows prefer to graze at dawn and dusk, so turning them into a fresh paddock after the afternoon milking can encourage more dry matter intake from pasture. The type and amount of what is fed in the barn will also will have a significant effect on how well they graze the pastures. Testing the forage quality of pastures can be very helpful, particularly in the first few years of learning how to graze. When taking the samples, be sure to observe what the cows are actually grazing before taking the sample. Use your hand (not clippers) to take the sample and try to mimic how the cows are grazing as forage is collected. Pastures can become a source of internal parasite infection, particularly for youngstock. Preventing internal parasite problems is essential on organic farms because treatment options are limited. After cows shed the parasites through their manure onto pastures, the parasites will live and continue to be infective for up to a year (longer in some areas). Animals that shed the most eggs are usually mothers after birthing, or youngstock. With this understanding, it is possible to manage pastures to keep the most susceptible animals (youngstock) out of the most infective areas. This is done by grazing them in areas that were not grazed within the past year. Sheep and goats have (mostly) different parasites than cows so, in some cases, multispecies grazing can be part of the strategy to create clean pastures. Other ways to decrease parasite loads in a pasture include harvesting hay, fallowing an area, and rotating with an annual crop. See parasite management and prevention guidelines below. Pay close attention to vitamins and minerals in the ration. Keep livestock in good condition. Minimize infection by avoiding ground-feeding and/or using feeders that make it difficult for animals to get manure in. Include high tannin plants (like birdsfoot trefoil, chicory, brambles, and many woody species) in hedgerows and pastures to reduce parasite loads. Farms with a lower stocking rate (total number of animals on the farm) generally have lower parasite loads. Since most of the infective parasites are in the bottom two inches of pasture, manage pastures to prevent animals from grazing the pastures too short. This is particularly important in wet weather and on more heavily infected pastures. Some farms report that improving soil fertility and using compost has seemed to help decrease parasite problems. This article is part of a series discussing pasture management on organic dairy farms. For more information, see the following articles. Emmick, D., K. Hoffman, and R. Declue. 2000. Prescribed grazing and feeding management for lactating dairy cows. USDA Natural Resources Conservation Service, Syracuse, NY. Murphy, W. 1998. Greener pastures on your side of the fence. Arriba Publications, Colchester, VT.
Robinson, J. 2004. Pasture perfect. Vashon Island Press, Vashon WA. Smith, B. 1998. Moving ‘em: A guide to low stress animal handling. Graziers Hui, Kamuela, HI. Undersander, D., M. Casler, and D. Cosgrove. 1996. Identifying pasture grasses. University of Wisconsin-Extension Bull. #A3637. University of WI, Madison, WI. Available online at: http://learningstore.uwex.edu/pdf/A3637.pdf (verfied 5 Sep 2012). Zartman, D. L. 1994. Intensive grazing seasonal dairying: The Mahoning County dairy program, 1987–1991. OARDC Research Bull. 1190 (1-49), OH Agric. Res. and Development Center, OH. Acres USA [Online]. Acres USA. Available at: http://www.acresusa.com/magazines/magazine.htm (verified 5 Sept 2012). Behavioral Education for Human, Animal, Vegetation, and Ecosystem Management (BEHAVE) [Online]. Utah State University. Available at: www.behave.net (verified 5 Sept 2012). Grazing Wedge [Online]. University of Missouri Extension Pasture-Based Dairy Program. Available at: http://agebb.missouri.edu/dairy/grazing (verified 5 Sept 2012). Holistic Management International [Online]. Holistic Management International. Available at: www.holisticmanagement.org (verified 5 Sept 2012). Manske, L. GrazingHandbook.com [Online]. North Dakota State University Dickinson Research Extension Center. Available at: http://www.chaps2000.com/grazing.asp (verified 5 Sept 2012). McNair, J. and R. (ed). Graze [Online]. Graze. Available at: www.grazeonline.com (verified 5 Sept 2012). NEPC Grazing Guide [Online]. Northeast Pasture Consortium. Available at: www.umaine.edu/grazingguide (verified 5 Sept 2012). Organic Livestock Production [Online]. National Sustainable Agriculture Information Service – ATTRA. Available at: https://attra.ncat.org/attra-pub/livestock/production.html (verified 5 Sept 2012). The Stockman Grass Farmer [Online]. The Stockman Grass Farmer. Available at: www.stockmangrassfarmer.net (verified 5 Sept 2012). Robinson, J. Eatwild.com [Online]. Jo Robinson, Vashon, WA. Available at: www.eatwild.com (verified 5 Sept 2012).